I can get behind goals. A few well thought out goals for the upcoming year can be a good thing. Especially for someone like me who is great at making lists and terrible at long-term planning. Hubby and I have been talking about the few main things we want to work towards and plan for this year. So I have a few lists of family goals, blog goals, and personal goals. 1. Finish the Nursery - I had wanted the nursery finished by now, but sometimes life happens. And I am the procrastinating queen soooo...yes. This is a big goal for the year as we are now at the 6 week countdown mark till Baby Real Inspired arrives! Also, he's going to need a better nickname once he gets here. Any suggestions? Decorating that just seems pointless. Full disclosure: this is an old picture. The wallpaper has been totally removed at this point. The last few days have been full of prep work for a kitchen work day on Saturday! Let's see if we can't knock this one out before baby gets here! 3. Organize the Closets - Just looking at my house, you wouldn't know that I can actually be organized. I love organization but I don't do well in breaking down those projects to actually get them done. I see the big pile, get overwhelmed, and promptly go make myself a cup of hot coffee, all the while convincing myself that tomorrow is another day. I'm hoping to work a little more on this with Hubby's help. He is so much better at breaking things down into manageable steps than I am. 4. Grow the Blog - I've decided to focus on two main things to accomplish this: a new, more professional-looking blog design(can't wait to share it! ), and participation in more link parties. I knew a blog could be work but I really didn't grasp how much! Eventually, I'd like to be able to monetize and make a little money on the side but that will be down the road. 5. Keep Up with the Ironing - Sure, that sounds funny, but I really hate ironing. It piles up and then Hubby has nothing fit for wearing to work. I am baring my insecure, wifely, soul here. So often I prioritize other things(like *cough* house projects *cough cough*) that I neglect something that is important to him and necessary for his job. So this year, I will strive to banish the selfish ironing procrastination! I'd also like to hear what kind of posts and projects you would like to see this year! If you have any suggestions, leave a comment below! 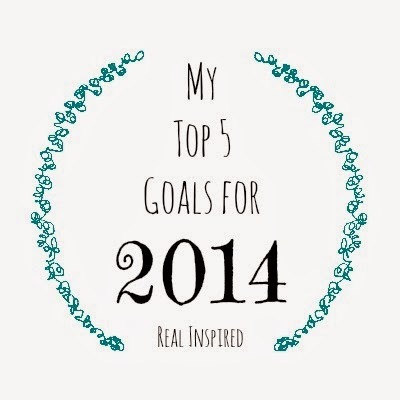 Feel like sharing your goals for the new year? I would love to hear them! And if you have a blog post of your own goals, go ahead and leave a link in the comment section and I'll head over to check it out! I may be linking up here.